I wish I could have met Audie Murphy before he died in 1971. I thought he was a god back in the early 1950’s while growing up. 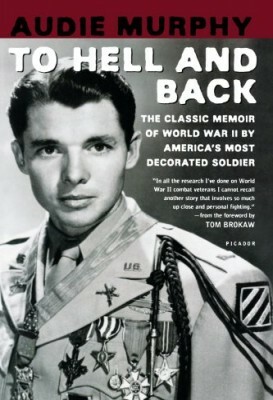 I was five years-old when “To Hell and Back” – a WW II war movie (1955) – came out starring Audie Murphy as himself. As the most decorated soldier in American history, Audie was awarded a ticker tape parade down Broadway. He was one of the most popular men in America. Historians say he killed 250 men in combat. What was seldom talked about – at least while he was still alive – was his mental problems. He had PTSD, but in his time there was no such diagnosis, and so he suffered a silent hell few could relate to. He was plagued with nightmares and slept with his gun under his pillow. Yet, the popular perception of him was that he was a well-adjusted, talented young man who was always quick to flash that boyish smile. When I think about how many young men, like myself, who grew up glorifying war I’m not surprised that we live in such a violent society today. My childhood games were all about killing bad guys. So were my sons. And their sons. Looking around the country today I see the violent seeds that were sowed in society during a time of posterity, and belief in the American Dream. The “Dream” is dead now. Cast under the bus by fear and hatred. As a combat veteran (Army/Vietnam 1970) with PTSD, I wish I could have asked Audie what it really felt like to be a hero (perhaps the last American hero) for killing so many men? I’m sure the price wasn’t worth it.